There’s no place to hide from this sucker! Our durable sampler easily extracts burrowing aquatic invertebrates from wet sand and loose muck. Just place the end of the sampler over the hole left by the invertebrate, or over any other area where you suspect specimens are located. Pull up on the sampler's handle and an area of negative pressure is formed in the void and the substrate as the inner piston moves up the sampler's housing, allowing specimens to be securely drawn inside. Made of heavy duty PVC, hardwood, and rubber. Not recommended for use in clay-based mud. Dimensions: 42"L x 2-1/4" diameter. 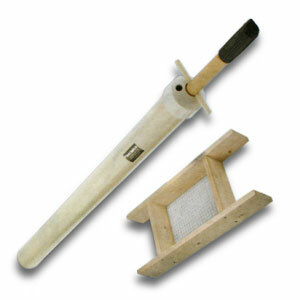 Shown with Shaker Sieve: After placing sample in the shaker sieve, move the sieve back and forth vigorously. Insignificant particles fall out, leaving the larger specimens behind for easy observation. Constructed of clear pine with a #7 polyethylene screen, reinforced by galvanised hardware cloth. Dimensions: 24"L x 10-1/2"W x 3-1/2"D.